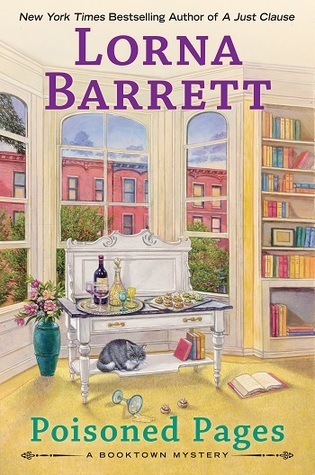 Description: Tricia Miles, mystery bookstore owner and amateur sleuth, throws a housewarming cocktail party in her new apartment and has cooked all the food by herself--quite a feat for someone who previously couldn't boil water. Then one of her guests is poisoned and dies. Tricia's left to wonder if her cooking is to blame or if there's something much more sinister at play. Either way, Tricia's once again in hot water with her ex-lover, Chief Baker. Why I Picked This Book: This was one of the first cozy mystery series I ever read and I love the idea of a town full of bookstores! My Impression: This series always makes me yearn for a bookstore that specializes in mysteries to exist me. Or really any good locally owned bookstore featuring a cat to exist near me. I love the town and the community feel of the bookstore. Mr. Everett and Pixie are such opposites and it is fun to see the really genuine bond between them. As well Angelica has become a character I really like. She can be a bit high handed but her heart is always in the right place and she normally knows just the right thing to do. Seeing her in a bit of trouble was a little different and I felt like it added a touch of vulnerability. There’s quite a lot going on in the little village of Stoneham with the mysterious death, the vandalism and the Chamber of Commerce election as well as what is going on with Angelica but it all fits together very nicely. The pacing is very good and this whole series is incredibly readable from start to finish. What keeps the series from really being a winner for me is that I don’t like Tricia very much. While she thankfully never drifts into TSTL actions she can come off as a bit judgmental and harsh which puts my back up. This is an entertaining and well paced series with a solid mystery. While I do have some issues with Tricia I always enjoy the mysteries in this series. Would I Read More of this Series/Author? Yes though since I’ve read a couple pretty close together I’ll probably get a few books in before I come back to this series. Would I Recommend this Book? If you enjoy a cozy this is a solid series though I recommend starting with some of the earlier books. Okay and Tricia is a main character so she cannot be banished to another town! I'll stick to the series I am about to get into and leave Tricia to her own devices! Yes, mystery bookstores - we'd all love to live in one, wouldn't we? If you ever get to Phoenix, stop by The Poisoned Pen. My favorite indie. Too bad there are some issues with the main character. It does sound like a fun book though.